Defence Secretary Gavin Williamson and French Minister of the Armed Forces Mme Florence Parly today (17 May) held the first Defence Ministerial Council since the announcement of a permanent and regular forum for the discussion of UK-France defence cooperation in January 2018. During the meeting a bespoke technical arrangement which will oversee the exchange of test pilots between the two nations was signed. 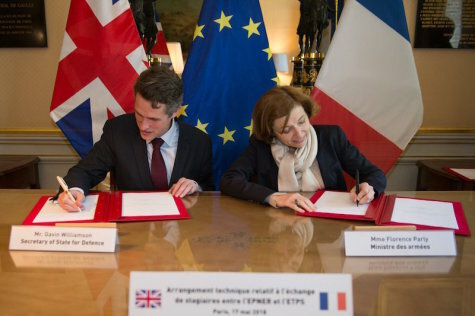 The agreement formalises an exchange enabling French pilots to train at the UK Empire Test Pilots’ School based at MOD Boscombe Down, and British pilots to train at the French Test Pilots’ School, Ecole du Personnel Navigant d’Essais et de Reception based on the Istres Le Tube Airbase. This reciprocal exchange of personnel ensures that the skills of military flight test, analysis and capability enhancement are shared between the Armed Forces of UK and France, further strengthening the UK’s relationship with France and building on the strong partnership between our armed forces. Defence Secretary Gavin Williamson said: “France is one of our most important allies and this agreement symbolises the importance of deep defence and security relationships. By participating in this exchange programme, we will strengthen understanding between our personnel. The UK and France have also successfully carried out the second development firing of the Sea Venom missile which will equip the Royal Navy and French Navy helicopters to prosecute a wide range of surface threats, from fast inshore attack craft up to corvette-sized vessels, including in coastal environments. Sea Venom has both ‘fire and forget’ mode as well as a ‘man in the loop’ capability, which allows full missile control until target impact. French and British Armed Forces operate alongside each other in NATO, including as part of the enhanced Forward Presence (eFP) in Estonia. The UK and France have been fighting Daesh together in Iraq and Syria, and last month launched coordinated strikes against Syrian regime chemical weapons stocks. The UK and French navies work together around the globe to uphold freedom of navigation and the laws of the sea, with UK personnel currently taking part in France’s Jeanne d’Arc naval deployment to the Asia-Pacific region, and are building on work last year to increase coordination of hurricane relief efforts in the Caribbean. We are also developing cutting-edge defence capability projects together and deepening links across our Armed Forces, vital actions as both the UK’s National Security Capability Review and last year’s French Strategic Review of Defence and National Security described a world of rising instability and unpredictability – which is why we are conducting the Modernising Defence Programme to make sure we are configured to address the intensifying and complex threats that we are our allies now face.